A Certified Senior Advisor (specialist in aging) who was widowed at age 34, lost her father in a car accident, temporarily moved to Australia to care for her ailing mother, and suffers her own health issues, Pamela Cuming is no stranger to the idea of death. 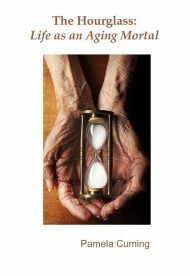 Written in an attention-grabbing narrative style, The Hourglass: Life as an Aging Mortal is the culmination of Cuming’s unwitting journey to face and accept death’s inevitability. In The Hourglass, 71-year-old Cuming shares a wealth of stories about friends, family members and acquaintances: the 90-year-old “queen” — a diva who demanded more and more as she aged; Cuming’s personal struggle to support her mother while maintaining her marriage, her writing and her sanity; close friends determined to die with dignity. She also offers well-researched advice on avoiding negativity, understanding doctors and their widely diverse bedside manners, and feeling healthier as seniors. Cuming’s five MAM (Mindset About Aging and Mortality) personality types will resonate with fans of Gary Chapman’s The Five Love Languages series, who will quickly recognize the fierce Warrior who resents his grown child calling the shots, the forlorn Castaway who adopts a “Chicken Little” attitude about the slightest problem, and others. Featuring believable dialogue and evocative visual descriptions, the book’s only real down side is the final chapter, which depicts members of the author-hosted “Mortality Club” discussing the meaning of death and quoting philosophers and thought leaders of past centuries. Compared to the down-to-earth message the rest of the book delivers, this ending feels esoteric and unnecessary.